The Zero Down Loan is Back for Minnesota First Time Home Buyers! Tough to save money in this day and age, isn’t it? Now, try to buy a house, save money and deal with life. Goodness, we've had many people plan weddings and start new jobs – that must be a saving nightmare. Save no more … well, at least for the down payment! MN Housing has introduced the Affordable Advantage program. This is a great alternative to the very popular FHA loan. 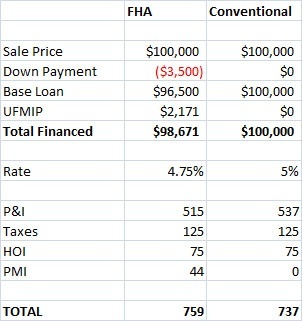 Currently, FHA is the main loan people are using in conjunction with their first time programs so all they need is 3.5% down. You can do conventional financing with 3% down, but the monthly mortgage insurance is quite high. Enough talking about zero down, just give us the facts Ma’am! Being able to do conventional financing could open quite a few more options in your house hunt. There are many sellers, banks especially, that don’t allow FHA financing. They don’t want to do any FHA work orders. Keep in mind, conventional financing does not guarantee you won’t have work orders, but you have a better chance. how me the numbers you say! Look at the difference below in out-of-pocket expenses and payment. As you can see, you will save on the payment, mostly due to the lack of mortgage insurance. Let’s just say this could be your opportunity to be a Minnesota first time home buyer in 2010.